With Christmas approaching, my not talk about rock 'n roll Christmas albums? Better yet, why not talk about a lost CLASSIC Christmas/Winter album? There's that old saying that the sure sign that a singers career is waning is that he puts out a Christmas album, such is the assembly-line mentality that comes with most Christmas albums. 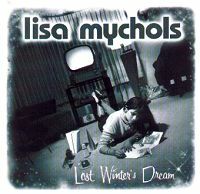 But LOST WINTER'S DREAM by Lisa Mychols is no mere Christmas rehash or cash-in. Sure it delivers yuletide-like songs, but it also evokes emotions that can also be felt at the holidays. We interviewed Lisa a few years ago when she fronted the Masticators. But, this interview we wanted to concentrate on her 'lost' classic album. E.C. : First, tell me how LOST WINTERS DREAM came about? Lisa: Well, it was during a time of my very first heartbreak! I was devastated! I am not the kind of person who turns to drugs and alcohol so I didn't even have that! What's left? Why not record a melancholy winter/Christmas CD! E.C. : Did you first intend to do jut a solo album, or was the Christmas theme always in the back of your mind? But alas, of ALL things that could have happened I got grounded the weekend of the deadline to get the songs and artwork to the label! By the time the next season rolled around Bomb wasn't taking anything but garage and punk. So I suppose I just hung on to that theme not knowing it would ever come up again. But I have to say that I have always adored fall and winter! There is just something so magical, refreshing, and independent about it. E.C. : Give me a timeframe for the album - when did it start (the recording) and when was it first released? Lisa: Oooh, wow! The relationship I was in split around October so by November I just started writing! That would make around December we probobly started recording.....and I think the tracks were finished by the middle of the summer! Nick and Darian are masters of music and really came through, as far as getting this album done! They were so dedicated to our project and at such late notice when the inspiration hit! E.C. : It good to see that the album is finally getting distribution on Rev-Ola records. What label was it first released on? Lisa: Well, we first released it ourselves as a cassette tape! And then a Japanese company picked it up! They had it for 3 years but it never got released. It's okay though, I am happy Rev-Ola made it available again. E.C. : How did you get involved with the Wondermints on this project? Lisa: Ha ha, well I called up Darian with my idea. I think he thought I was completely mad! Possibly because I just blurted out, "I want to record a winter record and I need your help!" Moments of silence followed before his list of "realistic" questions set in about money, musicians, studios, blah blah blah....but I was incapable of understanding anything he was saying and after all that I was still able to blurt out,"So when can we start?" Nick and Darian were my main two guys and we went from there! They even gave me rides all over the place for this project! (cuz' I couldn't drive yet!) And musically they know tricks and trade....hee hee, and sneaking around after hours after dark and VERY QUIETLY at other times of the night! But it got done! E.C. : Can you describe their production style? Lisa: Hmmm....I would say they have a sort of Spector-Beach Boy-garage-lush swirl electrical parade loungy swing thing going on! But they can rock too! But their sound reminds me of candy falling out of the sky! Lisa: I have to say yes. BUT it's also who they are. They have that gift and they don't mind challenging themselves! E.C. : Did the sessions go smoothly? Lisa: Haha! Okay, now we get into some dangerous territory! Okay, I got a bit bratty and possessive at times! I threw a couple tantrums and locked myself in a bathroom at one point out of frustration, but they guys....they stuck by me, bless their hearts! I wonder if I could have put up with that if I were them! I don't know but I sure love those guys! Till the day I die they will always remain in a very deep part of my heart! And I gotta say, Darian pushed me to do better in a lot of the record and, though I didn't want to admit it at the time (cuz' I was being a brat!) I was VERY grateful for his confidence in me. E.C. : How many songs did you bring to the original sessions? Lisa: I think I brought 9 or so? I can't remember...I should remember, I suppose! But I think I asked for song contributions from the boys...or maybe they offered? Nonetheless I got to CO-write with Nick and Darian and received a killer song from our LWD bass player Steve Kobashigawa. E.C. : You co-wrote some of the songs for the album with members of the Wondermints. What are they like to write with? Lisa: Oh my gosh! It's SOOO much fun to write with these guys! Me and Nick LOVE snowy balloons and Darian is just a sweetie pie for not laughing at half the stuff I would bring to him! They are so open to everything and willing to try anything! It's truly inspiring to work with people like this-it's a genuine kind of experience! E.C. : When we talked a few years ago about your group, the Masticators, we talked a little about your LOST WINTERS DREAM album. You mentioned that you were at your "craziest", saying that you were "either going to kill myself or do something artistic". Lisa: Yup! That is true. I was in a seriously bad "place"! It was a very very sad time and I sympathize with anyone who goes through heartache of any kind! The loss, the uncontrol of that...something you can't ever have back, "what do I do now?" feeling. Yea, Lost Winters Dream was a sad time but I also had the inspiration to do something and a very strong and positive unit around me. The Wondermints were my angels. E.C. : Although there are some depressing lyrics in a few of the songs, you do a good job of "hiding" these with upbeat songs. Was this intentional? Lisa: Well, I believe that when you are super focused in whatever state you are in and writing, you really connect with that moment of you and the universe. Your universe. You may be sad but hopeful...or just plain devastated! There are subconscious pulls like gravity and you end up just writing whatever gets written because in that moment it's what is inspiring. I think John Lennon called it channeling. But I am also typically an upbeat kind of person when it comes to music so that could be it too! E.C. : Do you have plans for any more solo albums? Lisa: Oh yes! I am pleased to announce that in a couple of months Sweet Sinsations will FINALLY be released! It will most likely start as an import, though. I'm always an import! But so were all my musical heroes! E.C. : What about other group projects? Are the Masticators history? Lisa: Well, besides for my own project I play with a band called The Waking Hours. When I first started playing music this kind of band was my ultimate dream band! We are a 3 piece just like The Jam...and we all ADORE The Jam! I loved The Masticators! We could have gone far together, I think, but we couldn't survive the member differences-well, we chose not to. We gave it a year but by that time the spark pretty much died. Everyone is doing their own thing now, which is great! There was a leader in each of us and I have no doubt we will all find happiness in our new musical adventures. E.C. : Finally, will you collaborate with the Wondermints again? Lisa: I'd love to but the boys are so dang busy these days! Although, I believe Darian penciled me in for lunch next week!